Nagpur: Maharashtra Government and China Railway Rolling Stock Corporation (CRRC) on Saturday signed a Memorandum of Understanding (MoU) for manufacture and supply of rolling stock like coaches to Nagpur Metro Rail Corporation (NMRCL) popularly named Majhi Metro at a glittering ceremony held at Hotel Radisson Blu. The NMRCL on the occasion handed over Letter of Acceptance (LoA) to China Railway Rolling Stock Corporation in the presence of galaxy of dignitaries including Chief Minister Devendra Fadnavis and Union Minister for Road Transport, Highways and Shipping Nitin Gadkari. Other dignitaries who graced the function include Guardian Minister Chandrashekhar Bawankule, Ramtek MP Krupal Tumane, Rajya Sabha Members Ajay Sancheti, Dr Vikas Mahate, MLAs Sunil Kedar, Sameer Meghe, Sudhakar Deshmukh, Krishna Khopde, Sudhakar Kohale, Dr Milind Mane, Vikas Kumbhare, MLCs Girish Vyas, Prof Anil Sole, Prakash Gajbhiye, N G Ganar, Jogendra Kawade, NMRCL Managing Director Brijesh Dixit, State Principal Secretary (Industries) Apurva Chandra and Vijay Singhal, Development Commissioner. On the occasion, Fadnavis also announced that the NMRCL will be given the work of Pune Metro Rail. “The state government has decided to entrust the responsibility of executing the Pune Mahametro Rail project to NMRCL. The demand in fact came from the people of Pune,” he said. Work on the Nagpur Metro, which is on fast track, will be completed by 2018, he added. Talking about Mumbai’s transport plans, Fadnavis said the state will introduce a common ticket for all the available modes of transport, including suburban railways, Metro Rail and Monorail, besides local bus services. “One can travel from any place to anywhere and reach within one hour,” he said. In a veiled attack on the previous governments, he said as a result of the planning in the last 60 years, only about 70 lakh people can use suburban rail services in Mumbai presently. “But our government will enhance the capacity to 80 lakh, which we will do in just two years as against the previous 60 years of rule,” the Chief Minister said. China Railways and Rolling Stock Corporation (CRRC) will manufacture rolling stocks like metro coaches and other railway coaches at Butibori in Nagpur. Chinese company will invest around Rs 1,500 crore in Nagpur for manufacturing unit and supply the rolling stock over more than 50 upcoming metro railways in various parts of the country. This would be first unit of rolling stock manufacturing in Maharashtra. 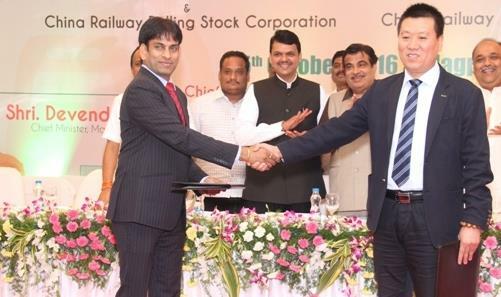 Brijesh Dixit, Managing Director of Nagpur Metro Rail Corporation Limited (NMRCL) recently signed an agreement with CRRC for supply of rolling stock for Nagpur Metro Rail. The Chinese company will require almost 100 hectare land in Butibori Industrial Estate for manufacturing unit. This will generate direct and indirect employment for hundreds of unemployed youths in city as well as in the region. The project will give another boost to the industrial sector of backward Vidarbha region. Leng You, a Divisional Engineer from CRRC visited NMRCL to meet Brijesh Dixit on Thursday. The NMRCL has issued Letter of Acceptance to CRRC for supply of 69 coaches to Nagpur Metro in 182 weeks. The design is an important part of the agreement as every metro will require separate coaches as per their design. A combination of 25 different items will be required for supply of rolling stocks. The design will be finalized within six to seven months. The Metro Rail will require two rakes of 3 coaches each to run from Khapri to Airport in first phase. The company will provide mock-up and then prototype before supply of final coaches. CRRC is a leading company of China in rolling stock sector for Metro Railways and other railways. CRRC undertakes design, manufacture, testing, commissioning and maintenance of locomotives and rolling stock, including: electric locomotives, diesel electric and diesel-hydraulic locomotives from 280 kW to 10,000 kW for mainline and shunting duties; high-speed trains of speed over 350 km/h; DMUs and EMUs for urban, suburban and regional transport; trams and light rail vehicles; metro cars and passenger coaches; as well as full line of freight wagons, such as covered wagons; open-top wagons for coal, ore, steel and timber; hopper wagons for grain, ore, fertilizer; flat wagons; double-deck container flat wagons; tank wagons for all types of liquid and chemicals; tipper wagons, schnabel and depressed center wagons, as well as track machinery. The other manufacturing units of rolling stocks are situated in Gujarat, Andhra Pradesh and Karnataka. CRRC has concentrated its effort on the development of high quality and environmentally friendly coaches. Currently, thousands of quality products equipped with non-flammable interior material, compact vacuum toilets, automatic train supervision system (ATS) has been supplied to domestic and customers around the world.